A graphic tale of modern comic books' descent into moral relativism. In the 900th issue of Action Comics, Superman decides to go before the United Nations and renounce his U.S. citizenship. " 'Truth, justice and the American way'—it's not enough any more," he despairs. That issue, published in April 2011, is perhaps the most dramatic example of modern comics' descent into political correctness, moral ambiguity and leftist ideology. We are comic-book artists and comics are our passion. But more important they've inspired and shaped many millions of young Americans. Our fear is that today's young comic-book readers are being ill-served by a medium that often presents heroes as morally compromised or no different from the criminals they battle. With the rise of moral relativism, "truth, justice and the American way" have lost their meaning. This story commences way back in the 1930s. Superman, as he first appeared in early comics and later on radio and TV, was not only "able to leap tall buildings in a single bound," he was also good, just and wonderfully American. Superman and other "superheroes" like Batman went out of their way to distinguish themselves from villains like Lex Luthor or the Joker. 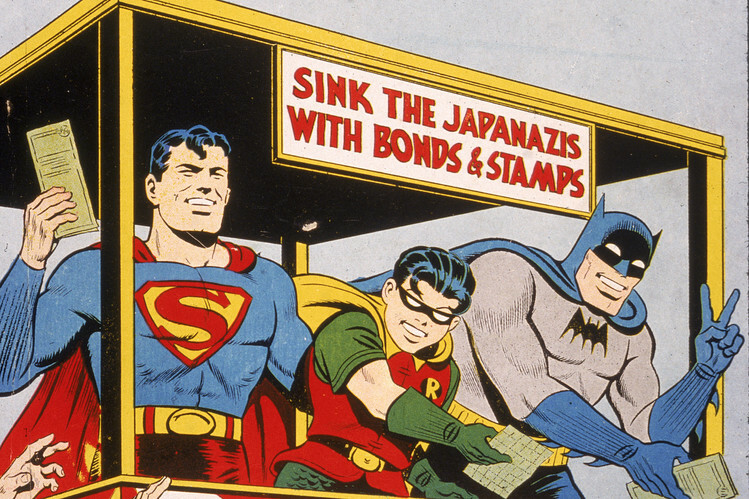 Superman even battled Nazi Germany and Imperial Japan during World War II. Superman also led domestic crusades, the most famous against the Ku Klux Klan. A man familiar with the Klan, Stetson Kennedy, approached radio show producers in the mid-1940s with some of the Klan's secret codes and rituals. The radio producers developed more than 10 anti-Klan episodes, "The Clan of the Fiery Cross," which aired in June 1946. The radio show's unmistakable opposition to bigotry sharply reduced respect of young white Americans for the Klan. The family of one of us, Paul Rivoche, fled Soviet Russia. The fact that Superman's creators, Jerry Siegel and Joe Shuster, were themselves immigrants, inspired Paul. Superman was a kind of immigrant, having come to Earth from Krypton, a planet "far far away." Paul grew up in Canada, but he wanted to depict through his art and illustrations appreciation for both North America and the United States. Similar idealism drew Chuck, the writer in our team, into comics. In the 1950s, the great publishers, including DC and what later become Marvel, created the Comics Code Authority, a guild regulator that issued rules such as: "Crimes shall never be presented in such a way as to create sympathy for the criminal." The idea behind the CCA, which had a stamp of approval on the cover of all comics, was to protect the industry's main audience—kids—from story lines that might glorify violent crime, drug use or other illicit behavior. In the 1970s, our first years in the trade, nobody really altered the superhero formula. The CCA did change its code to allow for "sympathetic depiction of criminal behavior . . . [and] corruption among public officials" but only "as long as it is portrayed as exceptional and the culprit is punished." In other words, there were still good guys and bad guys. Nobody cared what an artist's politics were if you could draw or write and hand work in on schedule. Comics were a brotherhood beyond politics. The 1990s brought a change. The industry weakened and eventually threw out the CCA, and editors began to resist hiring conservative artists. One of us, Chuck, expressed the opinion that a frank story line about AIDS was not right for comics marketed to children. His editors rejected the idea and asked him to apologize to colleagues for even expressing it. Soon enough, Chuck got less work. The superheroes also changed. Batman became dark and ambiguous, a kind of brooding monster. Superman became less patriotic, culminating in his decision to renounce his citizenship so he wouldn't be seen as an extension of U.S. foreign policy. A new code, less explicit but far stronger, replaced the old: a code of political correctness and moral ambiguity. If you disagreed with mostly left-leaning editors, you stayed silent. The political-correctness problem stretches beyond traditional comics into graphic novels. These works, despite the genre title, are not all fiction. For years a graphic novel of "A People's History of American Empire" by Howard Zinn has been taught in U.S. schools. There's even a cartoon version of "Working" by Studs Terkel. Che Guevara, the Marxist Cuban revolutionary, is the subject of several graphic novels, as is the anarchist Emma Goldman. Yet not all comics and graphic novels parrot the progressive line. "Maus" and "Persepolis" have both sold many hundreds of thousands of copies, and are taught in schools. Neither of these two mega-successes can be called left- or right-wing. Pixar's "The Incredibles" is a parable about the evils of bringing down great people merely because they feature special talents. You can, if you choose to, find libertarian content in "X-Men." Still the general message most modern comics send is—in a morally ambiguous world largely created by American empire—head left. This would matter less if comics were fading away. But comics are more popular than ever, as evidenced by Hollywood megahits like "X-Men." One third of English-as-a-second language teachers in the U.S. use comics. If you doubt the future of this medium, look to Amazon, which bought comiXology, a company that translates comics to e-books. Or try getting a booth this July at Comic-Con, the mob scene that is the annual comics convention. As a peer of ours recently wrote on comicsbeat.com, when it comes to catching up to the left in modern comics, "Conservatives are taking the remedial course." As our contribution to that course, the two of us poured years into a graphic novel of "The Forgotten Man," conservative writer Amity Shlaes's new history of the Great Depression. But ours is one book. We hope conservatives, free-marketeers and, yes, free-speech liberals will join us. It's time to take back comics. Mr. Dixon is the author of hundreds of comics and helped create comics characters such as Bane and The Spoiler. Mr. Rivoche co-created the 1980s figure Mr. X and has illustrated dozens of Batman, Superman and Iron Man covers.